One of the oldest jokes about progressive rock music is that it’s a genre specifically for dudes. In the BBC documentary on progressive rock, there is even a slightly humorous section where they interviewed progressive rock artists like Steve Howe and Robert Wyatt and they pointed out that women didn’t ever show up to their concerts. The lack of female input in the documentary definitely gave off the vibe that progressive rock was an enterprise that was largely male. While this ignores the musical contributions of such genre pioneers as Kate Bush, Curved Air, Renaissance, among others, it has statistically been the case in the past that there are more male prog musicians and fans than women. This trend is not limited to progressive rock- rock music in general has often, unfortunately, been a boys club, and female bands have often struggled with things that male bands have not. In reading about the all female prog group Mother Superior, I learned that, despite their local popularity and musicianship, they struggled to find a label that would sign on an all female progressive rock band for “marketing reasons”, and had to deal with a lot of condescension and chauvinism that eventually led in their disbanding in 1977 (…a blog post for another day). Mother Superior, and their polished, harmony laden cover of “Love the One You’re With”. Can’t you imagine them touring with Yes or Utopia? In the modern progressive music era, there are a lot more progressive bands with female vocalists and band members than ever before. Many progressive fans have enjoyed the vocal talents of singers like Nightwish’s Floor Jansen, Anathema’s Lee Douglas, and Marcela Bovio from Streams of Passion, but there are a lot of relatively new female-led bands with that are making a name for themselves as well. 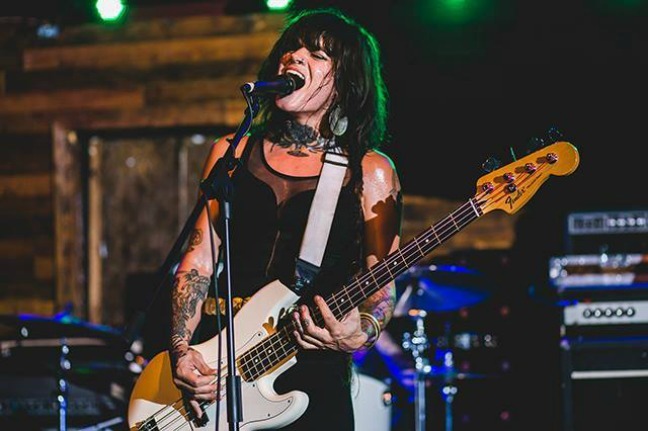 Here at Proglodytes, we wanted to pick a few female-fronted bands that we love here at the blog and that you may not have heard of, and allow for readers to add their own, along with links to the music, in the comments below. In other words, as this list is more of a primer than an exhaustive listing. Please check out these bands, and the others that people share! Bent Knee’s Courtney Swain: Courtney is a Berklee-trained vocalist and pianist with an incredibly powerful, unique voice. One of her greatest assets is her versatility. The first song I heard by Bent Knee was “Being Human”, and I’ll never forget the chills I felt from 3:14-on. Courtney shares the stage with 5 other stellar musicians, but her distinct vocal timbre and wild, wide range make her one of the most impressive vocalists out there, even in a musical scene that is overflowing with talent. I’ve seen Bent Knee two times now, and have been really impressed with Courtney’s vocal performance, as well as her charismatic stage presence. More songs to listen to: “Holy Ghost“, “Leak Water“. iNFiNieN’s Chrissie Loftus: The first song I ever heard from Philidelphia-born band iNFiNieN was called “Aya”, from their latest album Light At The Endless Tunnel. The beginning of the song features some complex, Middle Eastern-sounding scales. But I was immediately taken by vocalist/keyboardist Chrissie Loftus’s quirky, jazzy voice. She jumps deftly up and down the scales during the verses, and then switches to a powerful, forceful tone to finish out the song. Their latest album features some incredible performances from all musicians, but Chrissie’s vocal work is, to me, one of the highlights of this criminally underrated prog fusion band. More songs to listen to: “Brand New“, “Bottom of the Food Chain“. District 97’s Leslie Hunt: Leslie Hunt is the charismatic and ridiculously talented lead singer of District 97. She also holds the distinction of being the only American Idol finalist to sing for a progressive rock band. District 97 began as a group of guys who wanted to play Liquid Tension Experiment-type instrumental prog metal, but they made the correct choice in enlisting their friend Leslie to sing lead and help write songs. Leslie’s voice can be delicate at times, but she can also belt among the best. Apart from her tremendous talent, Leslie also knows how to work a crowd, dance during a prog song (even despite time changes), and “perform” without being corny. More to listen to: “All’s Well That Ends Well“, “Termites“. VUUR’s Anneke van Giersbergen: We already loved Anneke as the Cher to Devin Townsend’s Sonny, as well as the lead vocalist for The Gathering, but Anneke (who already has established herself as a solo performer ) is releasing a new progressive metal album soon that is pretty incredible. Anneke’s angelic voice pierces through the heaviest of tones, and her presence onstage is hard to compete with. I doubt any of our readers are hearing about Anneke for the first time, but her new band, VUUR, is debuting later this month. Who would you add to this list? Please leave a comment below! Tags: anneke van giersbergen, bent knee, chrissie loftus, courtney swain, district 97, dreadnought, infinien, kelly schilling, lauren vieira, leslie hunt, mlny parsonz, royal thunder, vuur. Bookmark the permalink.